Gone are the days when the bounce house was confined to birthday parties only. Today, you can have this fun-filled structure as a permanent fixture at your home backyard. And once set up, it’s a great way to divert the attention of your kids off their video games, TVs, smart phones, etc., and get them active outside the house while enjoying the fresh air. The simple act of your children jumping up and down on this structure can help improve their motor skill, improve their cardio skills, enhance their metabolism, activities, and so on. So, what’s the perfect bounce house to buy for your kids? In the post below, we’ve compiled a complete guide to help you easily find the best bounce house. We’ve also put together the 10 top-of-the-line bounce houses you can find on the market today to help you get an idea what type of bounce house to get for your kid. 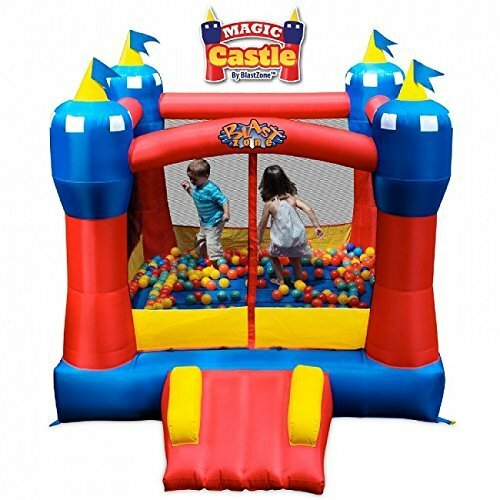 A bounce house is simply an inflatable structure, usually designed with bright colors, themes, and shapes like the castles or elaborate buildings. Most of the models feature a durable polyvinyl chloride, nylon, or vinyl exterior construction. An electric fan or a blower is used to keep them inflated. 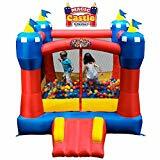 Bounce houses can also be referred by other names such as bouncy houses, closed inflatable trampolines (CITs), inflatable castles, bouncy castles, moonwalks, moon bounces, or jumpers. Regardless of what material is used to design your bounce house, all of them feature small pores along the seams. These help naturally leak air as your kids continue playing—ensuring the fan keeps blowing a stream of fresh air into it. Most of the models are usually supported by inflatable columns. They also feature up to 3 net enclosures to help you closely supervise your kids as they enjoy themselves. What benefits can a bouncing house offer your kid? Probably the main benefit of investing in this structure for your kid is to divert them away from the technological gadgets and let them have outdoor fun as they enjoy fresh air. As your children jump on the inflatable castle, they’ll be improving their cardio fitness level, making them healthier. Jumping will help increase your children’s bone density, grow their muscles, ligaments, and joints. Jumping on a bounce house will also improve your kids’ metabolism activity…and can actually be an excellent way to lose weight for obese children. If your child has certain sensory impairments, a bounce house would be of great therapeutic benefit to them. Remember that bounce houses provide a source of themed games and activities to your kids. Some models feature jungles, boxing rings, or basketball courts inside with a set of markers and tasks—like tug of war, racing, etc., —to be accomplished inside. These will eliminate boredom and keep your children active throughout. 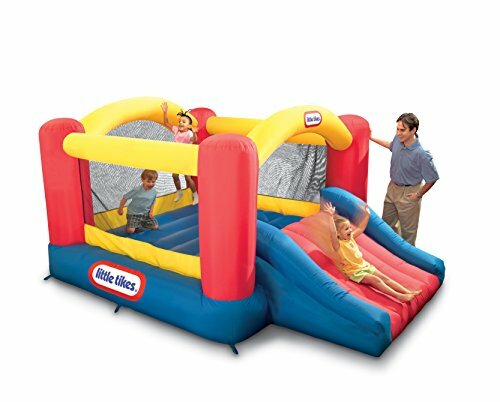 Our list of the best bounce houses kicks off with the Little Tikes Inflatable Jump 'n Slide Bounce House. This is one of the most affordable models on the market, so we recommend it to parents on a tight budget. The bounce house comes with a fun, bouncy design that lets your kids jump, slide, and bounce for hours. It features an incredibly large jumping area, 12 x 9 -feet, which can easily accommodate up to 3 kids at once. The tall mesh netting around the jump area ensures that your kids remain safe while jumping. The netting also provides maximum ventilation while allowing you to keep watch over the kids as they play. Because this bounce house comes with giant inflatable slide, it’ll add the ultimate excitement to the bouncer. In other words, your children will really love sliding their way out of the bounce house and climbing their way back up! Inflating this structure is easy and hassle-free, thanks to the included heavy-duty blower. It delivers a continuous flow that ensures the bouncer remains inflated throughout the playtime. Up to 6 states firmly hold this structure to the ground for maximum safety. The included storage bags allow you to easily store and take this bounce house with you to any place. Next up, we have the Blast Zone Magic Castle Inflatable Bouncer. Labeled by its manufacturer as their “all-time best seller,” this bouncer is bigger and better. It inflates in a matter of seconds and will accommodate up to 3 little princess or princesses. It features a fun castle theme—with eye-warming bold shades of blue, red, and yellow colors. Not to forget the flags and turrets that make it look like the REAL palace for your little prince/princess. It comes with a velcro entrance, safe slope slide, and safety netting, so you can sit back with peace of mind and let your kids party! The bouncer comes with a commercial-grade vinyl floor which translates to exceptional durability. What’s more, it features reinforced seams which takes its durability even higher—ensuring your kids can have fun it for much longer. Oh! Keep in mind that this structure comes designed for use both indoors and outdoors. It’s ideal for parties, backyard fun, and even sleepovers. As for indoor use, its extra-high walls and safety netting reach up to 60 inches from the bounce platform whole being low enough to clear standard ceiling height. The included blower is designed to run continually as your kids continue playing. All the necessary accessories are included in the package: stakes for both the blower and bouncer, storage straps, and the UL-approved blower. When not in use, you can easily roll down this castle into the size of a sleeping bag for easy storage/transportation. 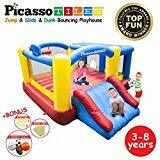 If you’re looking for the best inflatable bounce for home use, you can’t go wrong with the PicassoTiles KC102 12x10 Foot Inflatable Bouncer. This is because the structure comes as an all in one inflatable bouncing—with loads of activities and fun to keep your children engaged—while keeping its price tag unbelievably low. We like that this bouncer comes with an exceptionally huge play area (as huge as 12′ x 10′) to ensure your kids have a sufficiently large play area. It can accommodate as many as 3 children and a maximum weight of 250lbs. If your kids are into basketball, there’s no better way to introduce them to the sport than this fun structure. It comes with a built-in advanced basketball rim to enable your kids to have fun dunking as they improve their sporting skills. As if that’s not enough, the bouncer comes with 3 additional sports ball (baseball, soccer, and football) to ensure your kids have varieties of entrainments to keep them active. The included full-width slide adds sliding fun to the entertainment varieties. This bouncer comes with a full-size back entry door plus other multiple entrances to facilitate easy access for your little players. And as you’d expect in any other top-rated bouncer, this model has a mesh netting wall design to ensure the safety of your children. With the included heavy-duty 525-Watt blower, installing this bouncer is a breeze! Other noteworthy features include the built-in side pocket for convenient storage of water bottles, shoes, etc., and a carry bag to facilitate portability. The HUGE jumper is also suitable for indoor/outdoor use. That is, you can use it for backyard fun or use it in most indoor rooms as it has s height of 7’. Like all the other bouncers on this, this model comes designed to keep your kids happy and active for hours and hours. It provides your kids with lots of aerobic exercises while helping them develop gross motor skills. The entire bounce area comes fully enclosed by a safety netting which helps ensure that your kids can safely jump inside without falling off and getting injured. Setting up this moonwalk bouncer is a snap! The included UL-approved blower inflates the structure in a matter of 2 minutes. Likewise, taking down the bounce house is a breeze. You simply turn off the blower and allow the unit to deflate on its own, after which you can roll it down and pack it in the include carry case. For maximum longevity, this bouncer is constricted using reinforced polyester oxford. Its floor is constructed using the same material used in the commercial-grade rental bouncers for enhanced bounce, extra strength, and longevity. Costzon Mighty Inflatable Bounce House is a mighty structure full of joy and vigor. It comes designed using the extraordinarily heavy-duty, 100% puncture-proof 420D Oxford materials to unparalleled durability and longevity. No amount of excessive jumping can lessen the service period of this bounce house! When it comes to the playing surface, this structure doesn’t disappoint too. It offers your kids a wide jump surface to enable them to jump together freely. It can accommodate as many as 3 or 4 kids at a go. Tall mesh netting surrounds the jumping area to keep your kids safe throughout the playtime while ensuring maximum ventilation. The 50pcs colorful plastic balls included in the package as a BONUS will offer an unlimited source of entertainment to your children. 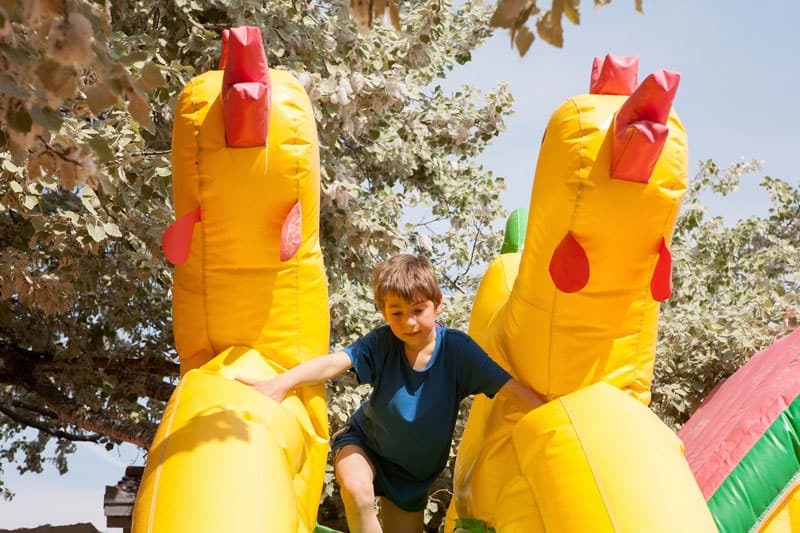 Not forgetting the inflatable slide that connects with the jumping area to let your children enjoy doing what they like most—sliding their way out of the bounce and getting back up again! Since the complete package comes with a continuous flow, a heavy-duty 680W blower, inflating and deflating this bouncer becomes easier and faster. Inside the box, you’ll also find an Oxford bag to help you conveniently take this bounce house to any place you want. For the parents looking for a budget-friendly bouncer they can set up at the backyard, the Little Tikes Jr. Jump 'n Slide Bouncer was designed with you in mind! This model comes with a truly compact design (measures10' x 7' x 5' when fully inflated) allowing it to fit nearly any backyard easily. Despite the compact design, the bouncer is still able to provide your kids with a sufficiently large jumping area of 7' x 7' which will allow your 2 kids to jump and tumble freely. It also features an extra-wide slide that’ll enable up to kids to race down at the same time. With tall walls with mesh netting surrounding the jumping area, you can rest assured that your kids are well protected throughout the gameplay. Plus, the netting allows you to easily watch your kids as they enjoy themselves. The included stakes that firmly hold the entire structure in place further promotes the safety of your kids. 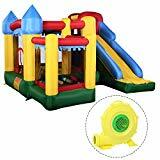 As with all the other bouncers we’ve discussed previously, this model also comes with a continuous flow, heavy-duty blower to ensure it remains inflated as your kids continue playing. The structure’s compact design and the included storage bag make it a highly portable model that you can easily transport to any place! 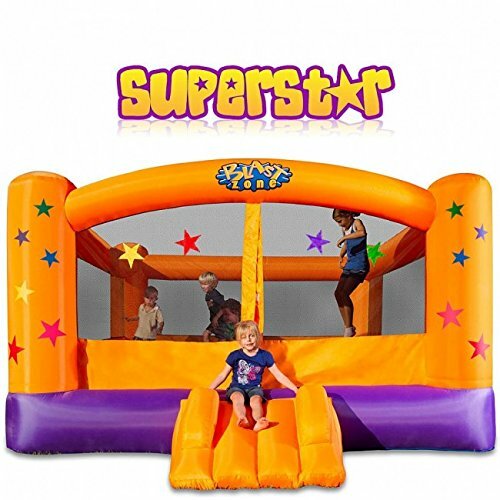 Blast Zone makes a comeback in our list…this time with the Superstar Inflatable Party Moonwalk. This particular model is a party favorite! It finds wind usage at birthday parties, church events, etc. Your kids will fall in love with this inflatable bouncer from the first sight, thanks to its eye-warming colors and star theme. Apart from the jumping surface, this model also comes with a ‘safe slope’ which offers your kids endless sliding fun while providing easy access to the Moonwalk. Parents will appreciate the fact that this bounce house a safety netting enclosing the jumping surface to keep the children safe. The included UL-listed continuous airflow blower will make it easy for you to set up (inflate) this structure. YARD Indoor Outdoor Bounce House is also a top choice for parents looking for the perfect bounce house for residential use, at a fair price. When fully inflated, the bouncer measures 9.5' length, 6.6' width, and 6.6' height. And it has a capacity of 3 children or a maximum weight limit of 250lbs. The bouncer features a bouncing area (measures 6.6 x 6.6 feet) which is large enough for up to 3 kids to bounce at once. Combine this large bouncing platform with the slide and your children will have hours and hours of fun jumping in this house bounce! You can choose to set up this structure outdoors or indoors. For indoor use: it has a height of 6.6ft which is low enough to clear the standard ceilings while being tall enough to keep your children safe inside. Quality gets better with this bouncer. It’s bounce floor and slide are constructed from the 420D Nylon and 14 - 16 oz. Vinyl material for the ultimate durability and longevity. As for your kids’ safety, the bouncer comes with tall mesh walls that enclose the jumping area to keep your kids confined in their little heaven. Since you can easily see through this netting, you’ll be able to monitor your kids’ activity closely. The heavy-duty blower (included in the box) will keep your bouncer inflated as your children continue bouncing on it. The stakes will firmly hold the structure to the ground. And the included storage bag will help you easily store or transport this bouncer to any place. If you’ve some cash to spend, we will encourage you to look for a high-end, all-in-one bounce house with multiple entertainment options. And one such model is the Bounceland Pop Star Inflatable Bounce House. 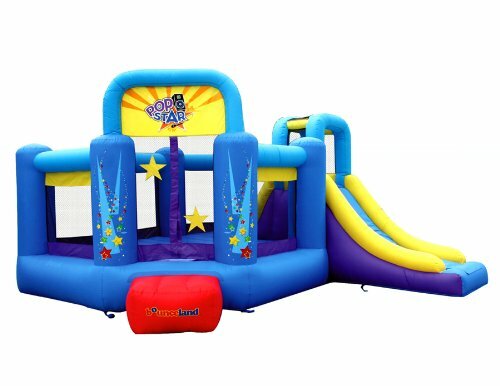 This bouncer presents you with a huge bouncing platform (10.5ft x 8ft) in addition to a long slide (7 ft. long). The two platforms together will ensure that your kids will have lots of bouncing and sliding fun that’ll keep them active and help them burn excess energy. Apart from bouncing and sliding, this bouncer also comes with a challenge in the form of a basketball hoop. This allows your kids to shoot some hoops as they bounce. If your kid is interested in playing basketball, this bouncer is truly the dream stage to help them grow their sporting career! The bouncer features large supporting columns, high railings, strong mesh enclosure, velcro openings—all of which work together to make it the safest bouncing platform for your kids. A strong UL blower comes with the package to help ensure the bounce house stays inflated so that your kids can have endless bouncing, sliding, and hooping fun. The bounce floor features a puncture-proof Laminated Oxford Terylene commercial-grade material construction to ensure maximum durability and longevity. The large carry case included in the box will help you easily store this bouncer when not in use or carry it with you to any place. 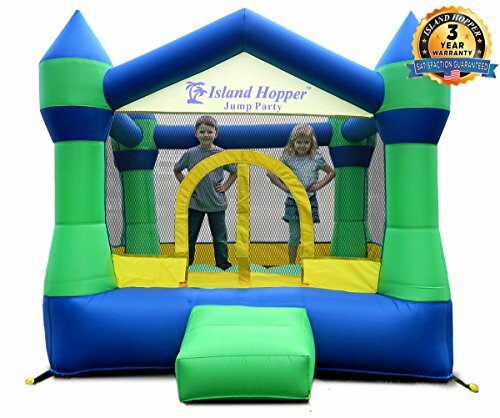 We close our list of the top-of-the-line bounce house reviews with the Island Hopper Jump Recreational Bounce House. This model is reasonably priced and is suitable for active kids and can be used in special kids’ events, say birthday parties. Designed for indoor/outdoor use, this bounce house measures 8’6” long by 6’9” wide by 6’ tall when fully inflated. And can accommodate a maximum of 3 kids or 100lbs. It comes with a double reinforced bounce floor to ensure it remains durable and lasts longer than most of its competition. It features a secure closure entrance to ensure your kids remain safe while having fun on the bounce house. We also can’t fail to acknowledge the 9 safe & secure tie-down loops & stakes that allow you to securely anchor this structure to your lawn (for easy setup and added safety). Included in the box is a continuous flow blower (to keep the bounce house inflated during the period it’ll be in use), user manual, 2 repair nylon patches, and a convenient carry case to help you easily take the bounce house with you to any place. Before you buy that bounce house, you need to carefully examine it to ensure it matches your unique needs and expectations. You want to buy a model that will offer your kids fun for an extended period of time and give you good value for your money, right? Look for a model made using durable, 100% puncture-proof materials. This will enable it to last long, even with excessive, regular use. NEVER sacrifice quality for cost. Otherwise, you’ll keep making trips to the market for new bouncers after every few months. Another crucial thing to look for in a bouncer is how safe it is for your kids. Obviously, the safest model should feature tall netting surrounding the jumping area. These will help keep your children inside the bounce surface and prevent accidental falls. Besides, the netting will help you closely supervise your kids while they’re playing. An added benefit of this netting is that it facilitates free airflow inside the jumping area. Also, look for the bouncer you’re buying comes with stakes to securely hold it to the ground. This will make it stable and safer. A pump (or blower, if you like) acts as the lifeblood of your bouncer. It’s responsible for powering (inflating) the structure to keep it up and ready for use. That being said, it’s important that you ensure the model you’re buying comes with a heavy-duty blower for hassle-free inflation. As you’ve noticed in our just concluded list of the top bouncers, all the products come with a continuous airflow heavy-duty blow to keep the bouncer inflated as your kids jump up and down in it. We also suggest that you come up with a budget of the amount of cash you wish to spend on a bouncer. This is simply because the bouncers on the market have different costs. Knowing how much you’ll spend on a bouncer will help you narrow down your list of options to models that fit your budget. Compare your final list and see which model has the quality and features that match its cost. What do you intend to use your new bounce house for? If you want to buy a bounce that can be used in events or for rent, then you should go for the biggest model available (i.e., the commercial grade bounce houses). However, note that these models are usually bigger, heavier, and costly. If you’re buying a residential model, however, anything that accommodates 2-3 kids will work for you. The residential models are light, small, and cheap. Some models are designed for outdoor use. Some models are also ideal for use indoors or outdoors. We advise you to look for a model that can be used indoors or outdoors. This will ensure that your children can still use it when it’s raining outside or if you have a special event in the winter period. A bouncer that comes with a storage bag or storage straps will help you easily fold down the structure for easy storage or to conveniently transport it to any place. You might also want to check if the bouncer comes with any challenges (like a basketball hoop, boxing ring, etc.) to offer your kids a variety of entertainment options. Look out for bouncers with themes that match your child interests. A warranty is also a good thing to look for in a bouncer. It’s a sign that the manufacturer has faith in the overall quality of their product. The longer (and more comprehensive) the warranty, the better. Blast Zone is one of the most trusted brands in the bouncer world. The manufacturers go the extra mile to provide you with the safest, highest quality inflatables you can think of—all while giving you the best value and buying experience. This is another trusted name that has prided itself in bringing smiles and giggles to the face of millions of children all over the planet for 40plus years. 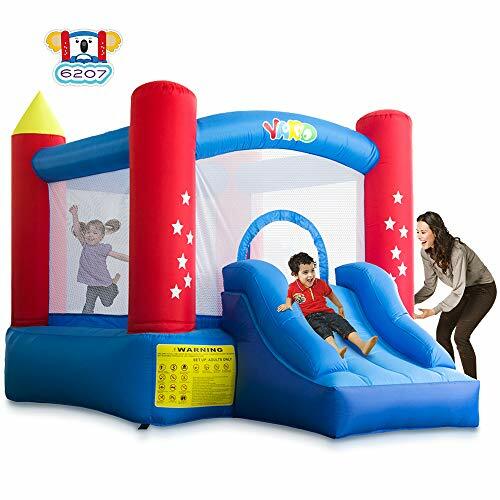 They offer you an extended range of top-quality bouncing houses and inflatables that fit every budget while providing your kid with endless fun. Magic Jump is the home to premium, 100% American crafted party inflatables. Established back in 1995, the southern California based company prides is proud to be the pioneer of high-quality inflatables that strictly adhere to the set industry standards on safety. Bounceland is also a respected name in the bounce house arena. They offer you exciting, colorful, and affordable bounce houses that are also sure to bring lots of smiles to your children. 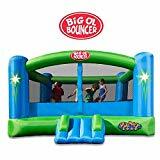 Like the other top brands above, this company produces adventurous, sporty, and thrilling bouncers that’ll bring new life to your birthday parties and outdoor picnics. As you already know, it’s possible to rent a bounce house for kids’ birthday parties or any other special events. But before you rent that bouncer, there are a few crucial factors to keep in mind to make the whole process successful. One of the key things to keep in mind when renting a bounce house is its size. These structures come with varying sizes, and the ideal size for you will depend on your unique needs. If the bouncer is meant for small toddlers, then a small bouncer will do. For bigger kids, you’ll need a bigger model. You should also know the number of children attending the party. The bounce house rental company will need this crucial info to guide you into picking the right model for you. If the bouncer is meant for use by adults, be sure the company offers you a high-quality commercial grade bouncer. This will enable it to withstand the tougher usage by the adults. You should also consider the weather conditions around the time you intend to hold the party. If the event will be held in the hot summer weather, getting a model with water slide can be an excellent idea. A model that comes with shade for the sun is also an added advantage. We strongly advise you against using your bounce house in bad weather or strong winds. Such weather is risky and might cause your bouncer to blow away if not properly planted to the ground. Having in mind the exact location you plan to set up your rented bounce house is also a good idea. First, it’ll help you decide if you have sufficient location for the size of bouncer you’re renting. Second, the place should be closer to a power source since the bouncer needs continuous airflow to remain inflated. If your bouncer comes with a water slide, you should also ensure you set it up near a water source. How much budget have you set aside for renting a bounce house? Having the answer to this question is crucial in that it’ll help the bounce rental company guide you into picking the best bouncers that fit your budget. PRO TIP: Does the company has insurance? Ensure that the company you’re working with has insurance for their rental equipment. This will help ensure that the children using the bouncer will be covered in case of any structural malfunction or accidents. Carefully inspect the bouncer to see if it’s damaged. If you discover any damages, make it known to the delivery person. They should be able to contact their office and let them there’s a problem that needs fixing. NEVER overload your bouncer. Stick the recommended number of kids or weight limit. Most of the times, overloading is the cause of accidents in a bounce house. 1. How much does a bounce house cost? To understand how much a bounce house costs, we can classify these structures into residential and commercial models. The residential bouncers are meant for home use and cost between $200 and $500. Commercial bouncers are ideal for bounce house rental companies. They have a greater build quality and cost higher than the home models…their price range from $1000 to $3000. Larger, fancier, and more complicated commercial models can cost up to $8000! 2. can you make money renting inflatables? Yes, bounce house rental is a booming business and you can make a kill. Like any other business, however, it’ll need proper planning for it to be successful. Plus, you should research the market to ensure you’re aware of all the pitfalls to avoid in the business. 3. What is the average size of a bounce house? 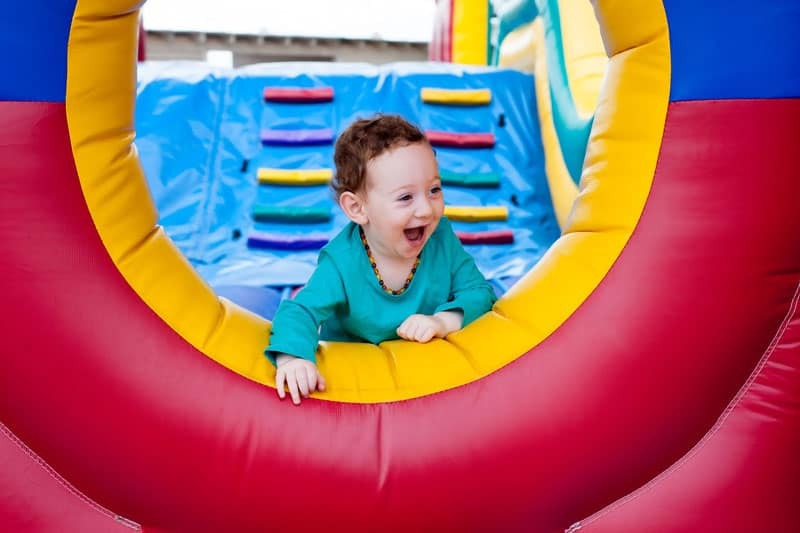 Bounce houses come in smaller and bigger sizes…but the standard average size for a bouncer is 15 x 15 feet. 4. Can you put a bounce house indoors? Yes, it’s possible to use a bounce house indoors. But this will depend on whether the model you’re using is designed for use indoors. Most of the models are intended for outdoor use only. However, a good number of them are also meant for indoor use—which means you can set up them inside your house in case of bad weather outside. 5. How much does it cost to rent a bounce house? The cost of renting a bounce house in the USA usually starts at $15 per hour. Most companies offer you 4-hour rate packages, making it $60 for 4 hours. The type of bouncer you buy will also determine how much you’ll pay. A common bouncer will cost you around $70 – $300 for around 4 hrs. The fancier ones will cost you a little bit…around $150 – $500 for 4 hours. Today, you can buy your own residential inflatable bounce and set it up in your backyard and make it accessible to your children at all times. As we did mention at the beginning, a bouncer will help keep your children off their smartphones, video games, TVs, and other technological gadgets. It’ll get them outdoors and let them play with their siblings and friends. It offers them plenty of exercise and activities to help keep them happy and healthy. Our list of the top residential bounces houses will help you easily find the best bounce house for your kids today. Be sure to follow our buying tips for more info on how to pick the most suitable model for your needs. Keep your kids Happy & Healthy with the best bounce house!